Incoming Mail (formerly known as You've Got Mail) is a program that tells you when it is time to start your e-mail client and read your e-mail - in this way you don't have to keep your default e-mail program running all the time. You can let the program check as many e-mail accounts as you like, and when you have got e-mail different sounds and cool animations can be played. 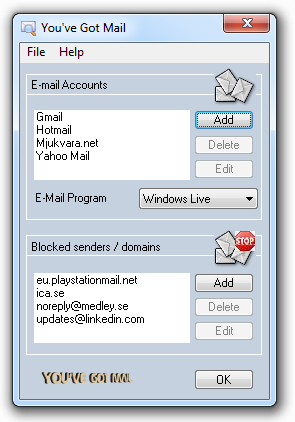 Incoming Mail works with Hotmail, Live, Gmail, Yahoo and many more email providers. Incoming Mail is very simple to use and no extra settings are necessary to get started. After you have downloaded and installed Incoming Mail you click 'Add' and enter your e-mail server, your username and password. 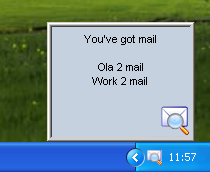 a window that tells all the accounts that have new e-mail and how many new e-mails one and each account has. Double-click on the letter to read your new e-mail. A sound is played and a cool animation also appears on the screen when you have got new e-mail so that you can see and hear that new e-mail has arrived. You can choose the sound yourself and many sounds and animationes also come with Incoming Mail. closed the program window. Under the Advanced menu there are many settings, for instance choice of sound and time for e-mail search. computer that you will install and use Incoming Mail on. The price per license is $14.95. After the registration you will enjoy future updates. After making payment PayPal will send an e-mail to notify us that you have made payment. Your license key will be e-mailed to you within 12 hours. Incoming Mail works on Windows XP/Vista/Windows 7/Windows 8 computers. check if there is a newer version to download. Note: It can take up to three days before you will get your question answered.